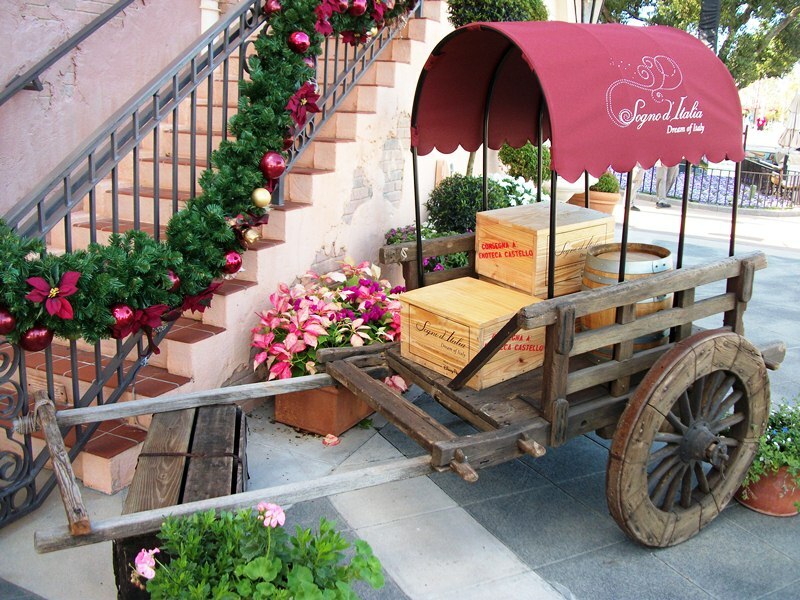 Walt Disney World did something rather special for the 2011 Epcot International Food and Wine Festival, they not only put together a cornucopia of delicious menus and beverages, they actually had their own wine crafted for the event. The chianti and pinot grigio, under the label of Sogno d’Italia, or Dream of Italy, were bottled by Placido and imported by Banfi and made available only at the Italy pavilion in Epcot. I picked up a bottle of each last year, though they are still available at Enoteca Castello in Epcot’s Italy, and recently did my own wine tasting. As with most wines, there is the description of the wine from the vintners and what your own palate discerns from the wine. Below are the depictions from the Sogno d’Italia (in italics), followed by my own thoughts. Sogno d’Italia Chianti – True to Tuscany’s winemaking tradition, this chianti is predominantly made with the region’s native Sangiovese grape. It is fresh, with a bright fruit character, and is eminently drinkable. It brings pleasure in both its aroma and taste, and makes a quenching match to a wide variety of foods, from the humblest wraps, sandwiches and finger foods to composed salads, pasta dishes and grilled meats. As a meat and potatoes and more potatoes kind of guy, I am constantly looking for a new table red wine to add into my rotation, and this wine has definitely made that list. This isn’t as complex or full-bodied as you would expect, but its thinner nature makes up for it with a simple, well-rounded flavor reminiscent of pitted fruits (plums, apricots, cherries). The chianti also has a delicious earthy undertone that is almost certainly is a result of the barrels. Grilled vegetables, such as asparagus or zucchini, or meats, particularly chicken and beef, are the perfect partners for this wine in a super dinner team-up. Sogno d’Italia Pinot Grigio – This pinot grigio is unique, in that it hails from Tuscany, a warmer climate than the northern regions to which pinot grigio wines were once relegated. As a result, it balances a fragrant bouquet and crisp freshness with succulent fruit flavors and a lingering finish. It pleases as a charming aperitif, and as a distinguished pairing to mixed antipastos, pastas in light sauces, shellfish salads, and broiled fish or chicken. 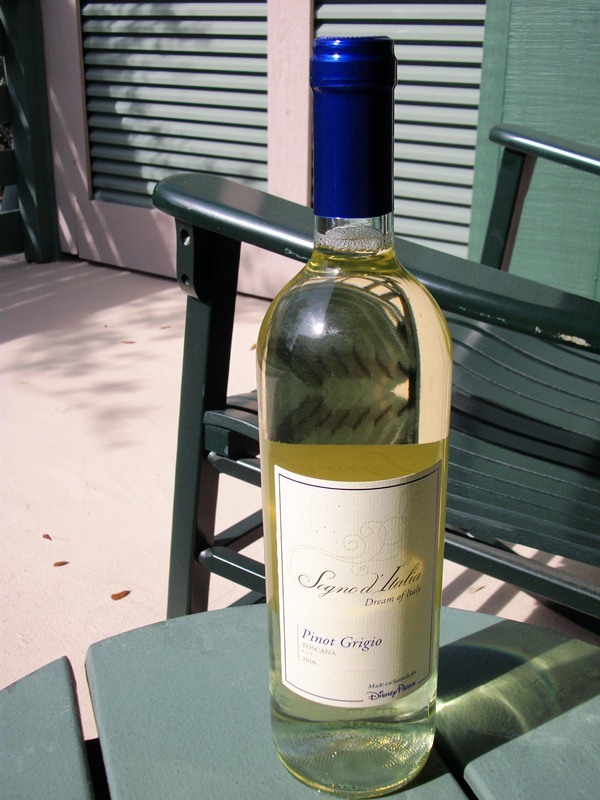 I’m not one to adhere to preconceived notions, such as white wines with chicken and fish, but definitely see the advantage of having the well pronounced flavors of seafood with this pinot grigio. There is a hint of fruit, specifically pears, but the wine is also slightly acerbic. Paired with desserts, specifically fresh fruit or a well devised cheesecake, or a strong cheese, goat, brie and bleu all come to mind, this white wine would be a welcomed accompaniment. 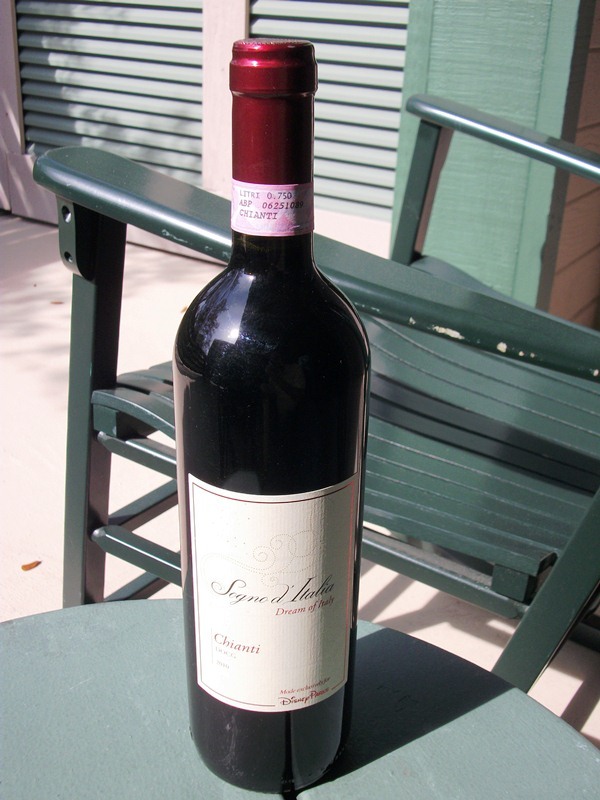 Overall, both wines have their place in your everyday wine rack, though I prefer the chianti over the pinot grigio, and considering this is Walt Disney World, I found them both to be reasonably priced. I can only hope that the Sogno d’Italia line continues with these two varietals and begins expanding and exploring other grapes.